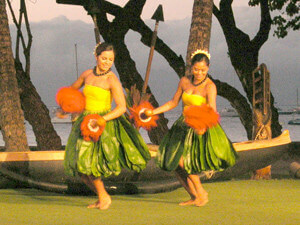 Hula is a special treat for the visitor to Maui. It’s the Hawaiian art form that is best known around the world, yet also the least understood. The Hawaiian islands were settled by Polynesian people around the year 500, and they proceeded to develop a distinctive culture. Because they had no written language, their history, folk tales and genealogies were passed on by chants. A typical chant was a long poem, spoken by men with the accompaniment of rhythm instruments. Women dancers provided a visual counterpoint to spoken poem, with costumes and body motions directly reinforcing the words of the stories. For example, rhythmic motions of the upper body could represent rippling waves, the motion of trees in the wind, or the emotions expressed by the poem. Lower body movement could echo the cycles of the earth and the heavens, and the volcanic power ready to emerge from the earth at any moment. The combination of chanting, rhythm beat and dancing became known as the hula. Today, the historical style of dance is known as hula kahiko, or traditional hula. When explorer Captain James Cook reached Hawaii in 1778 he found a well-established Hawaiian culture more than a thousand years old. The Hawaiian islands were well positioned as a way station for trans-Pacific voyages and as an operations base for whaling ships. Thus there were many incentives for Europeans to visit, settle and influence the indigenous people and their customs. During the 19th century, immigrants to Hawaii brought with them the traditions of Western music and musical instruments. Mexicans brought the guitar and the string bass, and Portuguese brought the braghuina, a four-stringed instrument that evolved into the ukulele. Visitors from many countries brought the songs and harmonies of Western Europe. Guitars, songs and harmonies were adopted by the Hawaiians and soon found their way into the dance. 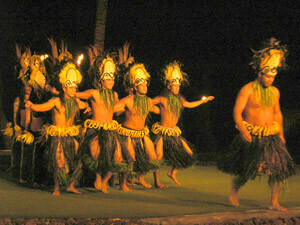 An entirely new form of hula evolved: the dancing is very much the same, but the chants and drums are replaced by songs, including newly composed songs, accompanied by a range of musical instruments. Traditional chants had always included poems about love and about the beauty of nature; the newly written songs greatly expanded this part of Hawaii’s poetic heritage. This new form was called hula ‘auana, or modern hula. 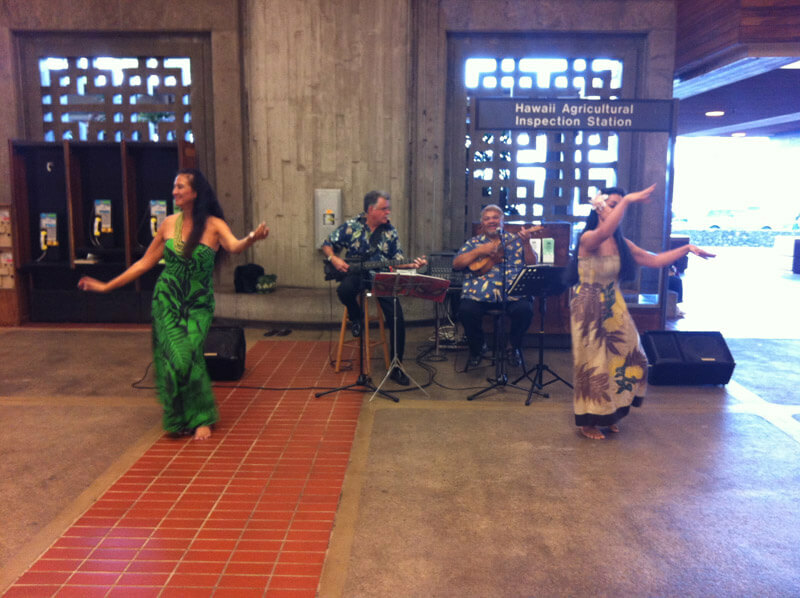 Modern hula has become so popular with both Hawaiians and visitors that when you see a performance today, it is almost certain to be in the modern rather than the traditional style. Where can you enjoy this beautiful art form when you visit Maui? Surprisingly, you may encounter hula even before you claim your suitcases at the airport. If you arrive at Kahului airport before 9:00 p.m., as you approach baggage claim you may hear strumming guitar and ukulele. A man begins to sing, in lilting syllables. As you round the corner, you see two women moving gracefully to the dance. Long dark hair drapes their shoulders and backs, and they wear flowered sheath dresses almost reaching the floor. Leis adorn their necks and they are bare-footed. Hips sway like palm trees in the wind, hands and arms stroke the air. These performances are a gift of aloha – love – and offer a great welcome to the island of Maui. – Shopping Centers. The Lahaina Cannery Mall in Lahaina, Maui has free performances several times a week. The keiki (childrens) shows are particularly charming. Other shopping centers on Maui also offer free hula shows, generally not on as frequent a schedule. – Luaus. The Hawaiian tradition of a luau (feast) has been transformed into tourist entertainment. We are particularly fond of the Old Lahaina Luau, which combines a number of Hawaiian traditions to provide a great entertainment. At their shows you will enjoy hula, Hawaiian food and of course spectacular tropical cocktails. The major hotels also offer luaus, which are generally less elaborate (and less expensive to attend). A tip to the vacationer: the farther in advance you book your tickets, at least at Old Lahaina Luau, the closer they will seat you to the stage. The best time to book luau tickets is right after you make your condo reservation! Hula is best enjoyed in person, yet there are also some wonderful performances available online. A good way to find Hawaiian dance videos is to search Merrie Monarch hula on YouTube. (The annual Merrie Monarch festival on the Big Island of Hawaii chooses the best performances by all-women and all-men groups, both traditional [hula kahiko] and modern [hula ‘auana]. In these videos you will probably not see grass skirts and coconut bras: those Hollywood inventions are standard fare for tourist shows, but not for dedicated practitioners of the art. However, you will see some group dancing that is spectacularly choreographed and performed, accompanied by song or chant depending on the style. When you visit Maui, don’t miss the chance to see and hear the beauty of this traditional yet modern art form. If you want to learn more about the history and practice of this dance, there’s a longer version of this article at the science website artchester.net. Hula is the language of the heart, therefore the heartbeat of the Hawaiian People. Perhaps it’s time to plan that Maui vacation now!